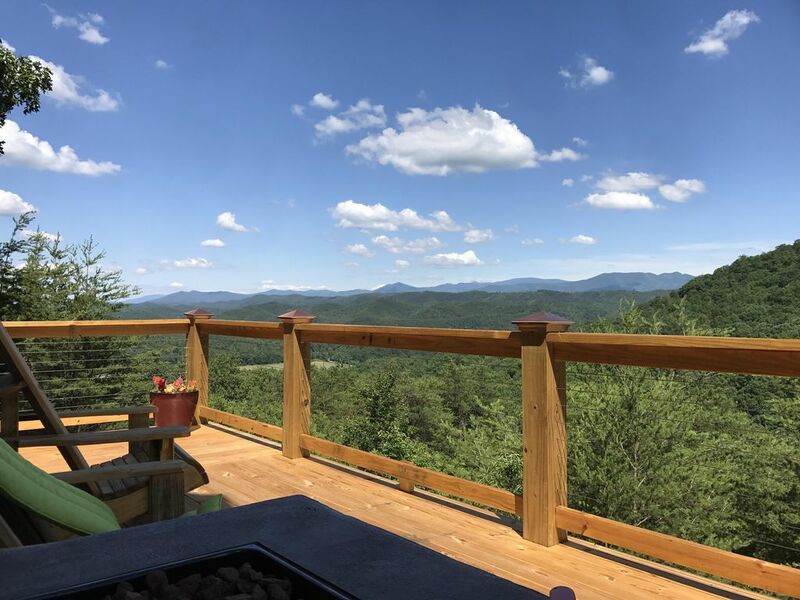 Beautiful Log cabin in private setting on top of the mountain in Highlands Bluff. Very private, short range and long range mountain views with spectacular views of the valley below as well. Come relax in the hot tub and watch the spectacular sunrise. This cabin is located next to Viewpoint. Motorcycle friendly with paved roads all the way to the cabin with plenty of room for large trailers. Pet friendly as well. We love dogs! This is our latest purchase. I found Tellico Plains while riding motorcycles and fell in love with the beauty, simplicity of the whole area. I decided I wanted to buy some cabins, make it home and share the area with other travelers. My cabins are located in an area called the Highlands. I truly believe it is the nicest area in Tellico Plains. It is the perfect combination of remoteness yet close enough to town and the Cherohala Skyway to be very convenient. Incredible long range and short range mountain views. This is the second year we have stayed at Rocky Top. Views are splendid. Watching the stars in the hot tub is spectacular. Living/kitchen area is very convenient. Very clean inside. Do take a flashlight. There need to be lights at the stairs and on the walk from parking. Our stay was absolutely amazing! The cabin was just like the pictures and description. The owner was very helpful and awesome as well. Overall a wonderful experience and I highly recommend. So clean, beautiful, and well taken care of! Doug is GREAT to work with and was so nice! The view is amazing and many amenities are included - coffee pot, towels, pots, pans, silverware! It was such an amazing place! If we ever go through again, we would definitely stop here! Beautiful property with great views, wonderful setting, not too far from town. My friends and I walked in and were so delighted with the accommodations. Warm, cozy, comfortable and the hot tub was such a wonderful addition. We will definitely stay here again. Amazing views, cozy, clean. Just an AWESOME Cabin! Me and my family really enjoyed our stay here at Rocky Top Cabin! The cabin looks just like the pictures, only more beautiful when you are there! The Cabin is in excellent condition. The owner is very nice, awesome to work with. There are a lot of activities close by including, hiking, spectacular sightseeing, wineries and many more things to do. Besides all that the cabin is very comfortable and relaxing. Great place to just get away and enjoy nature. We highly recommend this Cabin to your family, friends or just a personal get away to the mountains.